How I scraped something off the road and gave it to my mother-in-law to eat, but first, a Winter’s Tale of a frozen pipe. When we watch TV programmes about building houses or relocating and starting a new life in the countryside, or even another country, Gabrielle and I get annoyed that all the presenters seem to relish in the dramatic tension of problems for their subjects. It goes something like this: a couple have moved to France to do up a chateau, the budget is already shot, they’re badly behind schedule and the first guests have arrived at the airport but the toilet in their room isn’t connected and the plumber can’t be contacted—cue dramatic music, frowning presenter and cut to adverts. Not here, though, we always have lovely clients, who always leave our gite spotless when they go and, apart from the odd bit of maintenance, such as tightening up a loose tap and cleaning the wood stove, it all passes quite peacefully. Just before Christmas, we had a bitter cold snap. Clive and Marg, the last holidaymakers of the year, were due to leave the gite the same day as we would head for the ferry to spend Christmas in the UK with family and friends. 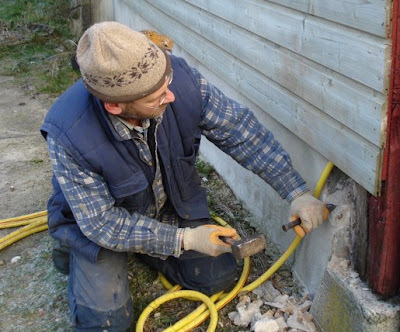 The day before, I was up early, out feeding the animals and unfreezing their water when Clive approached me and, in a typically British “I’m terribly sorry to bother you” sort of way, told me that they didn’t have any water in the gite—obviously a frozen pipe. You might understand how my first thought was that I needed a TV camera crew in attendance. After I’d supplied a bucket to flush the toilet and water for the kettle (the British always turn to tea in a crisis) I called Philippe, the guy who used to own our house to ask him where he’d laid the pipes, so I knew where to start digging. Annoyingly, I only got his answerphone but, bless him, he called me back within five minutes and I wandered about, mobile stuck to my ear, while we discussed where all the pipes were laid. We agreed that the most likely problem place was at the corner of our house, exposed to the cold wind, where the pipe had been encased in concrete but not insulated. It took the best part of the day to carefully—so as not to break the pipe—chip away at the concrete, warm the pipe with a borrowed hairdryer (thanks Celine) and wrap it up in insulation … and it all ended happily ever after and we took the ferry the following day as planned. (Spot the chick in the photo above). After dropping Gabrielle off at her mother’s house on Christmas Eve, I headed into town to buy some cough mixture and on the return journey, saw a dead pheasant in the road. Perhaps because of all our new experiences on our permaculture smallholding over the last couple of years, my first thought was “food” and looked for a suitable place to park the van. “Road-kill” as it’s termed, can be a useful and free addition to the diet. I picked it up and squeezed its breast to see whether it had been badly squashed (no) and found it still warm. To further impress my mother-in-law, I walked nonchalantly into her kitchen carrying cough mixture and pheasant, which provoked the desired humorous effect. Terry, her husband, told me that pheasants have to be “hung” from their necks, guts in, for a minimum of a couple of days. 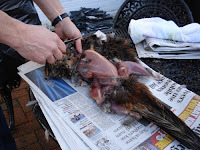 After further research in recipe books and on the Internet, I skinned it, rather than a more time-consuming plucking, cut off the damaged bits, and was able to get two good breast portions and two good legs off it. Shelagh casseroled it with apples and cream a few days later and said it was delicious. I was particularly proud as I thought that I’d legally appropriated a luxury food item for free until I passed a butcher and saw pheasants for sale as cheap as a supermarket chicken. From what I’ve read, so many birds are shot for sport that they can’t give the carcasses away and end up disposing of loads by burying them. I’ve changed my opinion over the years and I think that shooting a bird—that’s lived freely out in the open air—to eat, is OK but just for sport and then burying the carcasses seems all wrong to me.